We’re collecting stories of why people are voting against Ted Cruz. Send us your reason and we’ll send you a HATC sticker! We want to hear from you. Do you have a story about how you, your family, or friends have been impacted by Ted Cruz’s seriously terrible policy positions? 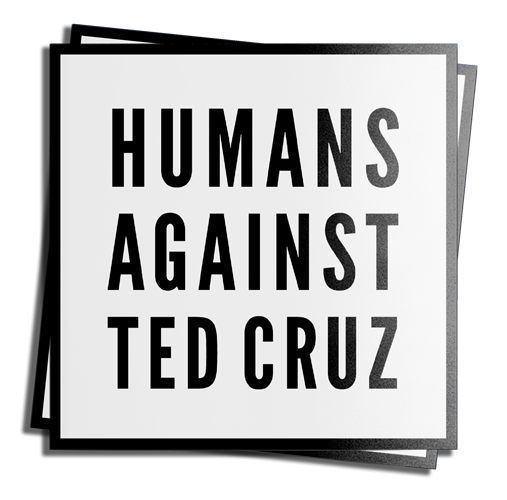 Submit your story using the prompts below, and we’ll send you a Humans Against Ted Cruz sticker! Think about how something Ted Cruz did — or didn’t do — has impacted you or someone you love. What issue that you care deeply about has Cruz taken action on — or failed to take action on — that affected real humans like you and me? Share a brief story using the following steps below. Step one: Who are you? Name, age, and background – e.g. what kind of work do you do, are you in school? Step two: Where in Texas are you from? And where do you live now? Step three: What are you passionate about? Step four: What’s the issue? And how does Cruz’s stance on it impact you or a loved one?